With all the new tools and technology constantly competing for our attention, it can be overwhelming to determine which ones are going to be worthwhile to invest in. Today I’m focusing on a highly beneficial tool for the other bloggers out there that will help you stay organized and rock your social media marketing with less effort. 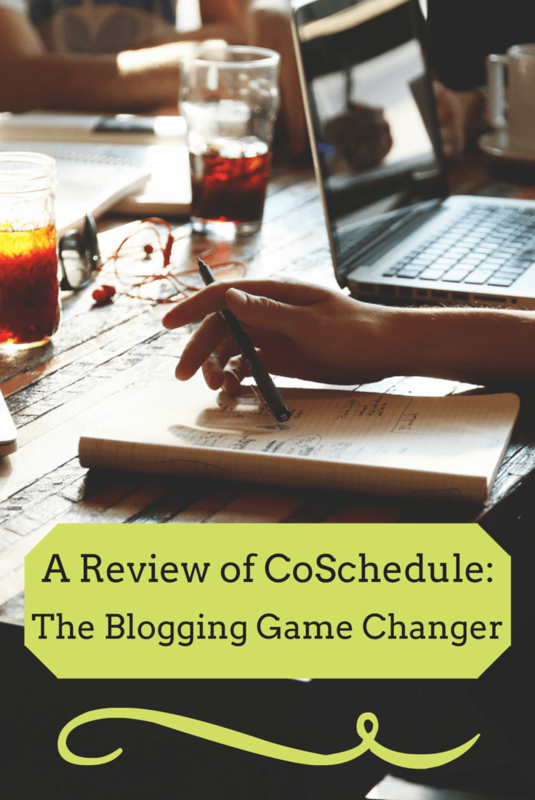 Many of you have likely heard of CoSchedule, but if you are like I was you may be hesitant to make the switch to using it. I simply did not want to pay for something that I thought I could easily do myself for free. Boy, did I not know what I was missing out on. Especially if you are a one-man (or woman) team as many bloggers are, your time is extremely valuable. Hours and hours of your time should not be spent on social media. Cue CoSchedule! Whether or not you have a team, CoSchedule will save you loads of time and will help you to manage your social media so much more efficiently. All you need to do is create an account and install the plugin directly to WordPress and you’ll have a drag-and-drop editorial calendar right at your fingertips, along with social media features that allow you to schedule content to be sent out automatically within the post editor. 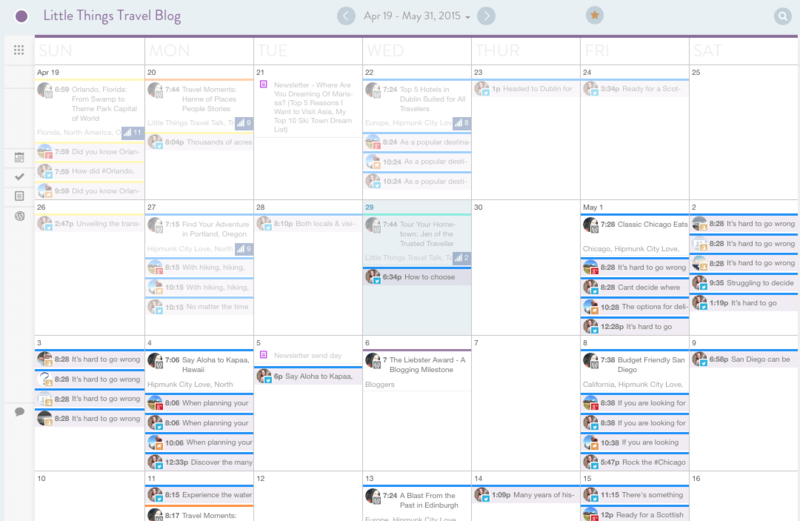 If you’re still not sure if it’s for you, take a peek at what my new editorial process looks like thanks to CoSchedule! I no longer have to set aside time for social media the day my post is published. I just scroll down and I can schedule all my social media right within the post editor. As you can see, CoSchedule already provides some date options based on optimal times to send out social media. The nice thing is that you can also select a custom date based on your preferences and what works best for promotion of your content. Even more convenient is that the photos from your post are automatically populated into the social media scheduler, so you can take your pick of which one to share! CoSchedule is an organization lover’s dream! Until now, I have used a calendar that I created in Microsoft Excel that I would update manually to keep track of both my past and future posts. Thanks to CoSchedule, I not only have my calendar right within WordPress, but it also automatically populates with my scheduled posts and drafts. You can even drag the posts and the scheduled social media to reorder them. The best part of it all is that you can see everything all in one place – blog posts, all social media, and in my case I also create notes in my calendar with the e-newsletters I send out. 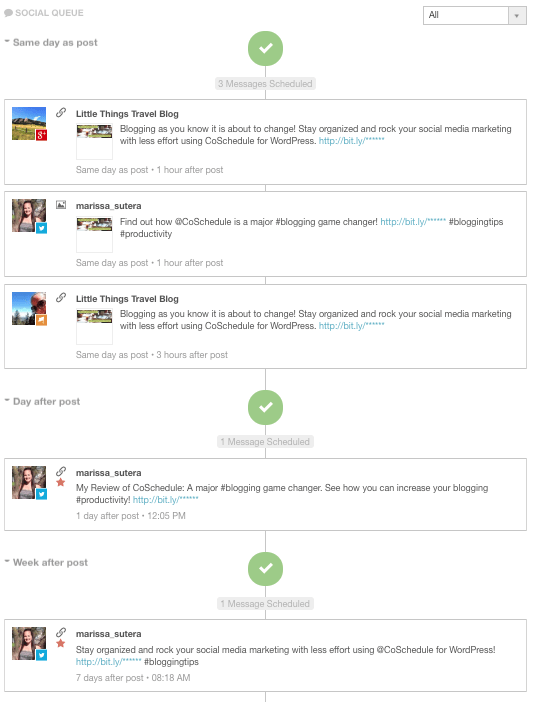 After your scheduled content goes out, CoSchedule also keeps track of the social shares. 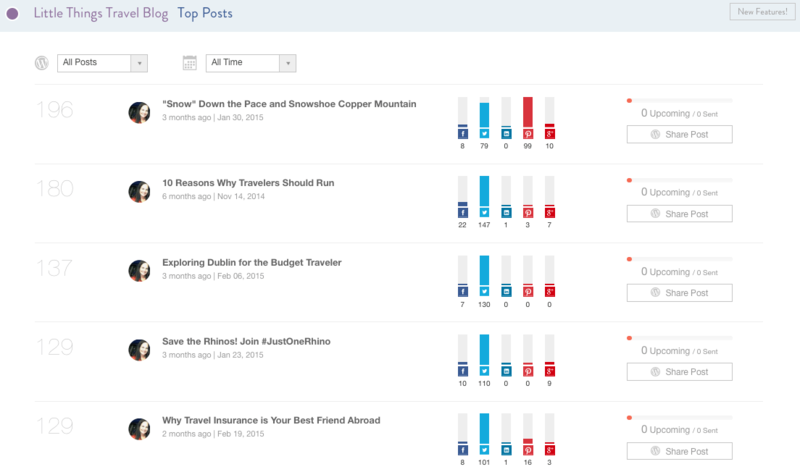 This makes it extremely easy to see your top performing posts, and then you can schedule additional social content to promote those top posts. 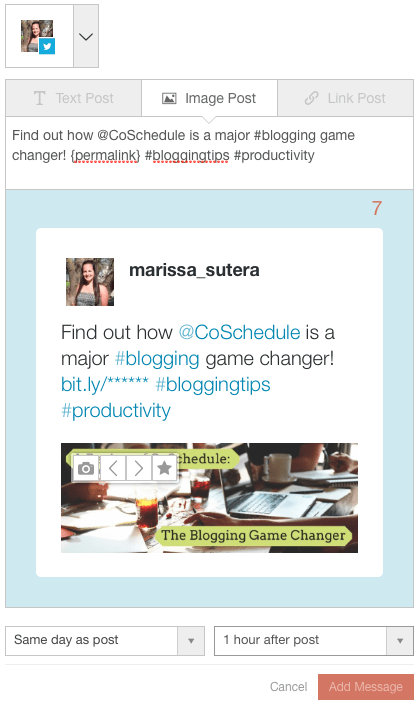 CoSchedule also connects with bit.ly, so I was able to use my existing account to shorten my links and track their performance. One option I haven’t needed to use yet is the features for team collaboration. 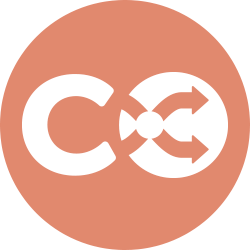 CoSchedule allows for multiple authors (how many depends on which plan you choose), and you can also assign tasks to others with a due date or leave comments on their work. Pricing starts at only $9 per month (if you choose the yearly billing option), which is a steal in my opinion for the amount of time it saves when blogging. An iPhone app. The browser version on my phone just isn’t the same. It would be fantastic to have a convenient app that allows me to move things around on the go when necessary. Integration with Pinterest. This is one platform I still need to manage manually. This may change with the new Pinterest and Buffer integration, but I’d rather not pay for Buffer separately so it will be interesting to see what will happen. A space for general notes and thoughts that is not associated with a specific date. An option to tag other pages in Facebook posts. Some posts I still have to schedule directly in Facebook if I wanted to tag another page, but it would be convenient to be able to do that right within CoSchedule. Now that you know more about CoSchedule, start your free 14-day trial now to get a feel for how CoSchedule can help you be more productive and lead to a more successful blog! I’d love to hear what you think!